Here is a video of a homeless man playing a public piano in Sarasota, Florida, as part of the Sarasota Keys Piano Project. It requires no introduction or commentary. That moment was about as great an experience as I have ever had with public art. I stood by that piano for almost an hour, just waiting to see what kind of people would sit down to play; each time I returned to the train station, I walked by to see what was going on. 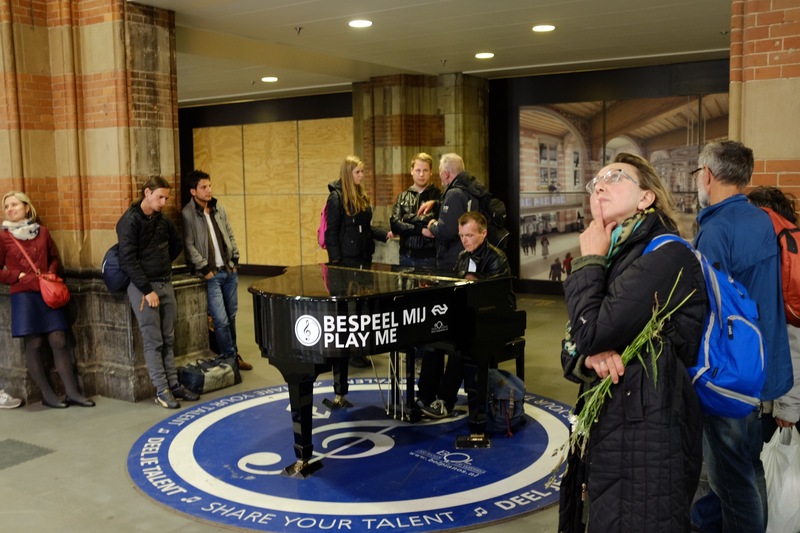 People took turns politely, complimenting and thanking each other, and the pianists ranged from a few Asian tourists to very obvious commuters (as the man in the photo is most likely a Dutchman coming hom from work). The piano music mellowed and calmed the experience of the busy train station. It also opened up the space and contributed to the rhythm. I was so moved by the music, the openness and trust experienced between the city, its residents and strangers, that I’m convinced every city should have multiple public pianos in places like train stations, post offices and outside the DMV. Categories: Art, Culture | Tags: Amsterdam, florida, florida sarasota, homeless man plays piano, piano music, piano playing, public art, public piano, sarasota, sarasota florida, The Netherlands | Permalink.